Tracy Aviary - Halloween Hoot: After Hours "Birdlesque"
Find a sitter and come to an adult only Aviary Halloween party. You can experience the Aviary in a unique way with a cheeky Halloween "birdlesque" show (a burlesuqe parody show of our birds), adult beverages of all sorts, dancing, shenanigans and a celebration of our owls. This is event is 21+ ONLY and general admission tickets include a welcome drink and a show. 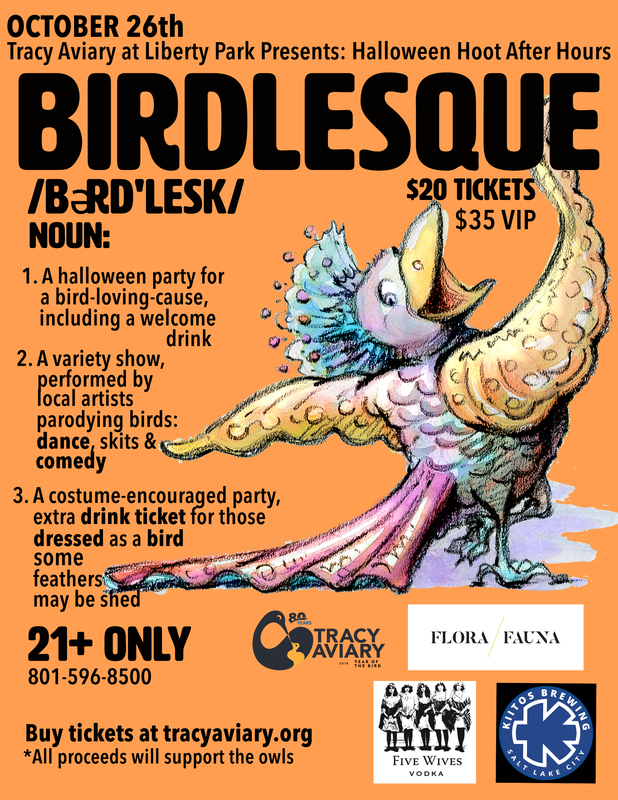 Dress up as a bird and receive an additional COMPLEMENTARY drink ticket. Additional drink tickets $5 each. You can purchase food at the event from Fire & Slice and San Diablo Churros. We are inclusive of all people of all genders and viewpoints. All welcome! **Proceeds will benefit our owls and conservation initiatives.